Sairam and welcome to the fourth episode of “Satsang with a Techie”. This satsang started with an accidental meeting in a restaurant in Bengaluru between two childhood friends, Varun, a techie who lives in Bengaluru and Vivek, an alumnus of Sri Sathya Sai Institute of Higher Learning who has settled down in Prasanthi Nilayam to dedicate his life in the service of Baba. Following the chance meeting, Varun becomes somewhat curious about spirituality and agrees to come to Prasanthi for the weekend to continue his education in spirituality. Saturday arrives and Varun is in Prasanthi and has His first darshan (this is set in 2009). After this, Varun and Vivek discuss many things. The current episode takes us to the morning of the second day, which is a Sunday. The two friends meet again after morning darshan. Let us now join them. VARUN: Hello Vivek, there you are; I was looking for you! VIVEK: Everything OK this morning? VARUN: Sure; had breakfast, darshan, enjoyed the Bhajan session and all that sort of thing. More than anything else, I am dying to resume our conversation, which had to be cut off at a most interesting point last night. Ready? VIVEK: Of course I am because I too am enjoying this dialogue; you know, it has helped me to clarify my own thinking quite a bit. OK, you get to call first, and lead anyway you like. All this revolves around plain civics and social responsibility. 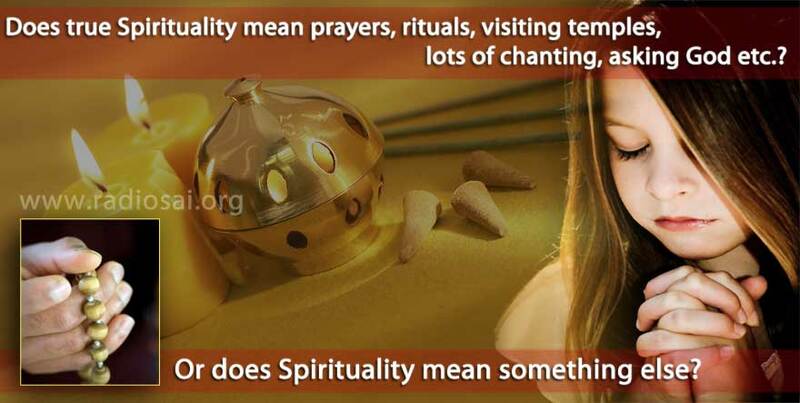 What has all this got to do with Spirituality? That is what I am not able to understand! VIVEK: I am glad you asked that Varun, because most people do not understand that at its core, Spirituality is all about duty, responsibility and service, especially to Society. VARUN: What?! Is it not about prayers, pilgrimages, rituals, visiting temples, lots of chanting, asking God, if there is one, for this and that, and that sort of thing? VIVEK: That of course is the popular impression; however, that is not what true Spirituality is all about. VARUN: That’s absolutely amazing! Then there sure is something I really do not know and need to know. VIVEK: Don’t worry, for you have come to the right place! VARUN: Enough of this preamble. Let’s get started. VIVEK: I agree. Let’s go back to the discussion on Surat. What do you think is the lesson it teaches all of us? VARUN: I thought we went through that just now. Did I not say something about civics and Society? VIVEK: You sure did and all I want to say is that those remarks could be distilled into a few simple Golden Rules. VARUN: And those rules are? VARUN: There you go again, flying in the face of the realities and complexities of modern Society! Honestly, the way this discussion is going, I don’t think we are ever going to converge! VIVEK: Varun, I know why you are feeling this way. It is a good sign really, and your impatience actually helps me! Anyway, let us put that aside for a moment. First of all, let me assure you that no one is asking anybody to be involved in everything. All I am saying is that in today’s highly-interlinked and fast-moving Society, there HAS to be shared responsibility; otherwise, problems would mount and suddenly they could explode, catching most people totally unawares - that’s what I am talking about. VARUN: Not quite clear; give me an example. VIVEK: Sure, I will. Listen, as a techie, your work must have taken you to America many times. VARUN: Yes, that is a fact. VIVEK: OK, then tell me; how do you find the road traffic there? VARUN: You know Vivek, it is interesting you ask me about it. The volume of traffic there is much, much higher compared to what we have in India. And people also drive faster. But the amazing thing is that the accident rate, calculated in terms of number of deaths per passenger mile is much, much lower than in India. VIVEK: I am well aware of that and that is the reason I asked you the question. 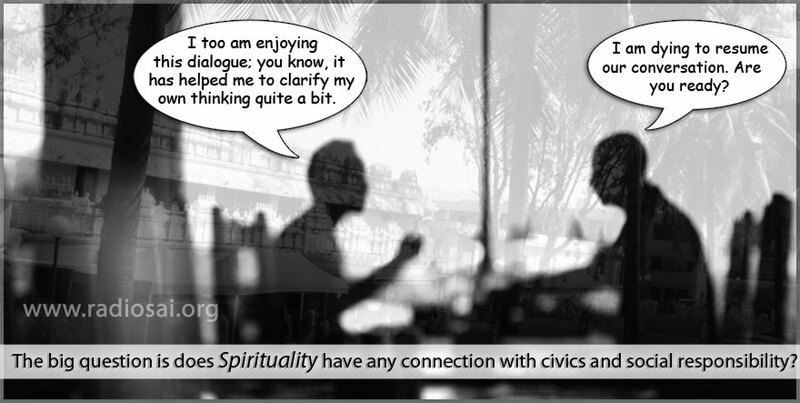 VARUN: Are you saying that there is some connection between that and Spirituality? VARUN: Oh my God! Come on Vivek you must be joking! Cars, the ultimate in materialism for the average individual, connected with Spirituality! Frankly Vivek, I don’t want to appear to upset you but I do wonder whether you are getting it right. Look, in your view I might be a dumb techie, but you know, I have seen my grandfather pour over the Vedas, the Upanishads and things like that. And I always assumed, though I did not understand one word of all that stuff, that Vedas and Upanishads were what Spirituality is all about and not road traffic in America! What’s going on Vivek? Are you caught between two worlds and have thereby become confused? VIVEK: [laughs] Thank you Varun for expressing so much concern about me! I know very well the doubts that are crossing your mind right now. By the way, since you brought up the Vedas and the Upanishads, let me tell you that my question was intended to drive home the point that the essence of those precious scriptures apply even to modern highway traffic! VARUN: What?! You must be kidding! Have you gone bananas or something? VIVEK: Hold your horses for a moment friend, I know very well what I am talking about; all it requires is for you to be patient for a few minutes and hear me out fully. By the way, patience is one of the virtues that the Vedas and the Upanishads call for, and you would agree that patience is a must both in the bullock cart and jumbo jet eras, right? VARUN: [sighs] Oh well, have it your way! You are my good friend and so I resign! VIVEK: Cheer up Varun, things are not that bad. 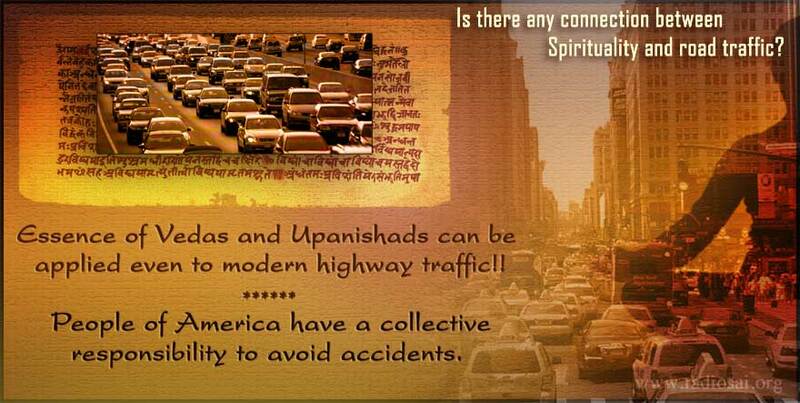 Let me make it easier for you by quickly wrapping up this argument about the connection between Spirituality and road traffic. 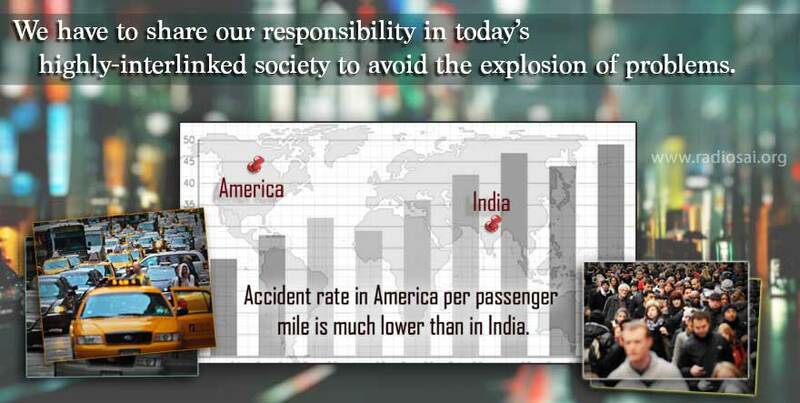 You said that the accident rate in America is much less compared to that in India, though we have far fewer vehicles. You know the reasons of course. VARUN: Oh sure; who does not? VIVEK: Very well then, we shall not spend much time over that, but I hope you would, for the sake of record, allow me to list them. VIVEK: Good; the first thing is that at the individual level, most drivers in America drive carefully, keeping in mind that others are also using the same highway and that together, they have a COLLECTIVE responsibility to avoid accidents. This they do by observing road rules as best as they can. Agree? VARUN: I agree. They read the road signs carefully, always stick to the speed limit, signal when changing lanes, keep to the right if they are going slower, do not tail-gate, etc. VIVEK: Good, and thanks for pointing out all that. In addition to all that, I am sure you would agree that most people over there take fairly good care of their cars; that is to say they do regular maintenance and all that. VARUN: Not merely that; they are very strict about wearing safety belts, taking special care when taking children in cars, avoid talking on cell phones while driving, etc. VIVEK: Thanks for helping me. Now Varun, listen carefully to my question. Do people do all this because it is required by law there or for some other reason? VARUN: You know what? That’s really a good question! Oh yes, there are laws regarding all that we are talking about, but more than anything else, people there make it a point to follow the rules. VIVEK: That exactly is what I was aiming at. Why would they do that? What’s there in it for them? Why don’t they break the rules as we here do, with so much glee and enthusiasm? VARUN: Before I answer your question, I must wonder whether at all we have anything called road rules over here; I mean, often there is not even such a thing as a road! 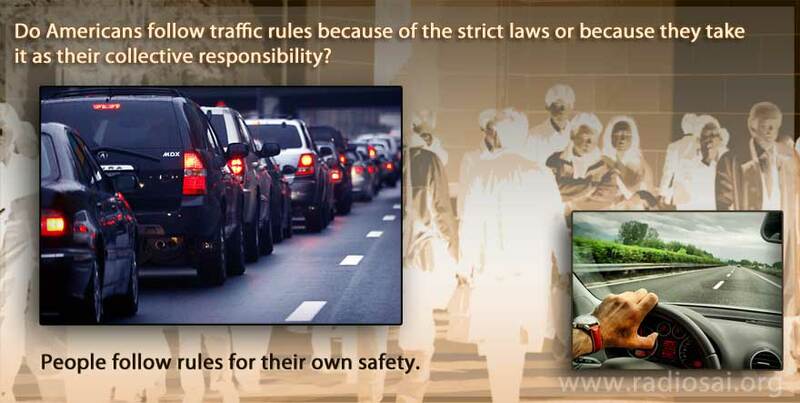 Why talk about road rules? VIVEK: [laughs] That’s a good one! Now answer my question: Why do people follow road discipline so meticulously in America when it seems to be a natural human tendency to beat the rules when possible? VARUN: Well, there is a very good reason for it. VARUN: Listen, people there know that if they follow rules, then they would be safe. VIVEK: OK, one man might follow the rules but all others might violate them. What happens then? VARUN: That does not happen. VIVEK: I am aware of that but can you tell me exactly why that happens to be the case? VARUN: Simple; everyone understands the purpose and the utility of the rules; everyone appreciates that the rules are meant for their own safety, and that is why they follow them. VIVEK: Excellent, because it leads me back to my Golden Rule 1 of Spirituality! VIVEK: I mean that since the micro and the macro are always interconnected, one cannot artificially create a bubble and try to live in that, assuming that what happens outside cannot and will not ever affect us. VARUN: Are you saying that it all starts with individual discipline and that it is only when everyone accepts responsibility at the individual level that there would be harmony at the macro level? VIVEK: That’s exactly right and it leads to Golden Rule number 2. 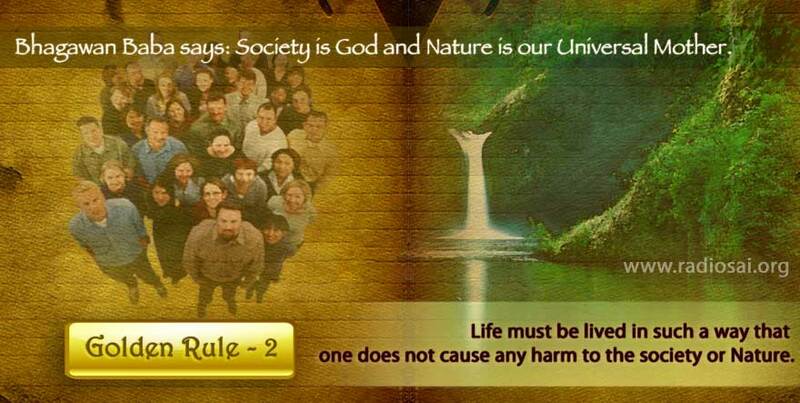 VIVEK: Golden Rule number 2 says that life must be so lived that we do not cause problems to Society in any way and/or disturb Nature. VARUN: Assuming for a moment that I accept all this, unless you make it clear how all this is connected with Spirituality, I am afraid we would be merely nibbling at the edges. VIVEK: You are making a very good point, and Swami does deal with it head on by saying that Society is God and that Nature is our Universal Mother. VARUN: Society is God? I never heard that one before! VIVEK: Actually, that teaching comes straight from the Vedas, and it is not at all a new idea. VIVEK: Honestly Varun, what I am saying is indeed true. There is a famous Vedic hymn known as Purusha Sukhtam, which is all in praise of the Supreme One. And the very first line of Purusha Sukhtam emphatically declares that Society is God. VARUN: But listen, I thought the idea of Society is a modern concept. VIVEK: That is because we try to form our ideas about Society merely from modern books. In fact, our ancients went very far in unravelling the connectivity that prevails across the entire Cosmos. VARUN: You mean there is a Cosmic dimension to Spirituality? VIVEK: Of course, and it is all spelt out in the Upanishads and in the Bhagawad Gita in particular, although rather tersely, I must admit. VARUN: I must say my head is beginning to spin. But listen, if it is all buried away in ancient texts and in a subtle form, how come you seem to know all about it? VIVEK: Good question. Actually, all these concepts and connections are indeed too subtle for me to have decoded them all by myself. However, I have managed to pick up a few of the essential points because I regularly follow the Discourses delivered by Swami and later reflect intensely upon them, along with a lot of supplementary reading of course. VARUN: Obviously, all this is just too much for me, and you would agree that we fellows who are stuck in the rat race cannot ever find time to understand all this. VIVEK: But don’t worry. Knowing the problems we children of modern times have, Swami has reduced most of ancient knowledge into a set of simple aphorisms, if I might call it that, so that we can easily remember what to do under various circumstances. VARUN: Right now I shall suspend my judgement, but let us get back to the idea of Society being God. Explain that to me, along with the link between micro and macro, living in a bubble, etc. Let me first see what you have got to say about all that, and after that maybe, we can take it further from there as needed. VIVEK: Thanks Varun; you have set a great challenge for me and let me see how I fare. Seeking God’s grace, let me begin as follows. 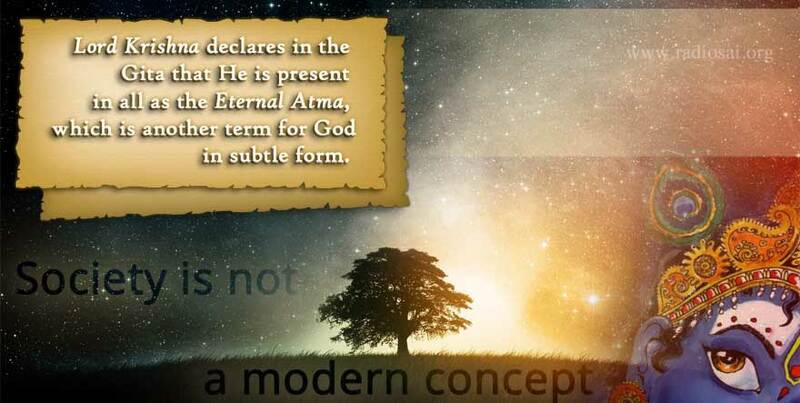 In the Gita, Lord Krishna declares that He is present in all as the Eternal Atma, which, in simple terms is just another term for God. VARUN: Are you saying that God is present in all? VIVEK: I am not saying that, but Lord Krishna is! 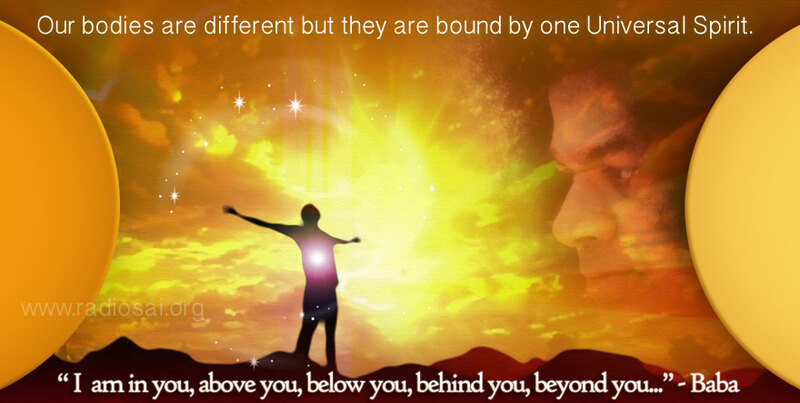 And Baba stresses that Omnipresence of God by telling His audiences ever so often, “I am in you, above you, below you, behind you, beyond you,……” etc. VARUN: If I get you right, what you are saying is that though bodies are different, there is one Universal Spirit or Soul or something that binds us all – is that it? VIVEK: Bravo! You have spoken like a true techie! Your summary is clear, sharp and precise! Congrats!! VARUN: Thanks for the compliment but listen, there is something here that I simply do not understand. OK, God is in all though in an intangible form maybe, and all of us are linked to this one God. 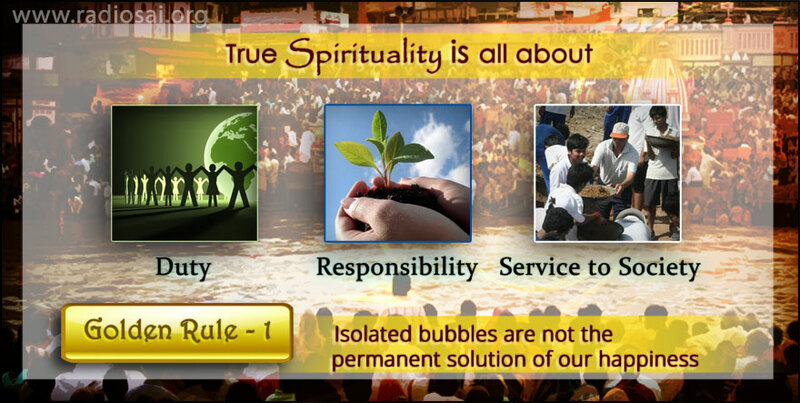 But what has all that got to do with Spirituality, living in a bubble as you call it, etc.? VIVEK: Everything, and that is the point I now wish to come to right away. Let me see – how do I start? OK, maybe I could start with what I might call the Primary Identity Crisis? VARUN: Identity Crisis? That is the sort of thing head-shrinks talk about and make money! When did you turn a psychiatrist?! VIVEK: Listen Varun, this is serious stuff, and so let us drop all this banter, OK? Earlier, you agreed that though bodies are different, yet an Invisible God latent within each of us links us all together - you said something to that effect, right? VARUN: I agree I said something like that. VIVEK: Good, so we now have the following situation. If you look at humanity as a whole, you have two options. One is to see things superficially, in which case, people would all appear differently, as black, white, brown, etc., some rich and some poor, some sick and some healthy, and that sort of thing. And the other option is to allow the superficial differences to fade away and see all different beings as just one Supreme Cosmic Being – agree? VARUN: Listen Vivek, I really don’t know what you are getting at. But from my side let me tell you most emphatically that there is no escape from the fact that the world and indeed the Universe are full of diversity. In fact, the evolution of the Universe is all about one splitting into almost infinite diversity. This is the way your God has ordained it, if I may put it that way. Are you asking me to hide myself from this dominant fact that stares at each one of us right from birth to death? Are you asking me to bury my head in sand like an ostrich? VIVEK: Hold on buddy, don’t get so excited! I fully understand precisely what you are saying and freely admit that this world is all about diversity. One cannot ignore it – no question about that. VARUN: In that case, what is this discussion all about? VIVEK: Ah, now we are getting somewhere! VARUN: I would say we live in this world and have to survive in it against all the problems and difficulties that the world throws up all the time, often in an unexpected manner. That is how we must react to diversity. It is an inescapable, empirical fact; we can’t duck it. As for God being in all, I think that while that concept might apply at an abstract level, when it comes to real-life problems like stock-market crashes, flu pandemics, terrorism, mass poverty or whatever, I don’t see where God comes into the picture at all. VARUN: Hold on for a second and let me finish please! I don’t mean to say that I belong to that camp. At the same time, there is something I simply cannot understand. 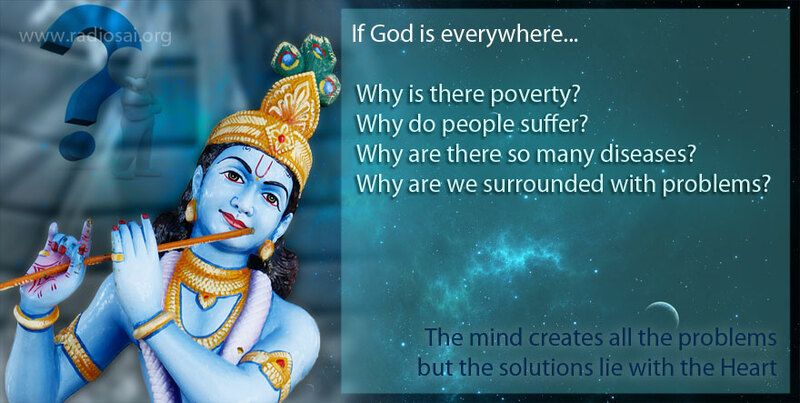 I hear spiritual pundits often say: “God is everywhere.” OK, in that case, why does He not do anything about the huge problems humanity is facing right now? I have not heard anyone give a proper answer to that. VARUN: What are you smiling about? You think I am talking nonsense? VIVEK: No Varun, nothing like that I assure you. I am smiling because you have put “the other side of the argument” if I might call it that, neatly and crisply. What I am trying to say is that based on what you have said just now, I can clear your doubts fairly easily, taking up one after the other the various points you have made. In other words, I was smiling because you have made my job so much easier – that’s all! VARUN: I am not sure I understand what you are driving at, but go ahead and give me an answer to the points I have just raised. VIVEK: Sure I will but I am afraid I have to put it off for the next time we meet; you know why, don’t you? VARUN: [looks at his watch] You are right Vivek; I guess there is just time enough to grab a quick lunch, after which I have to rush to catch the bus for Bangalore. VIVEK: That’s right, and so we shall take a break here and go for lunch. But remember, you have a whole week to think about the various points we discussed during your first visit to this place. I hope you liked your visit, and would come regularly. VARUN: Absolutely no doubt about that Vivek. This visit has been far more fulfilling and elevating, in many ways I might add, than the usual partying I used to do earlier during weekends. And of course, talking to you and learning the ABC of Spirituality, has been the icing on the cake! 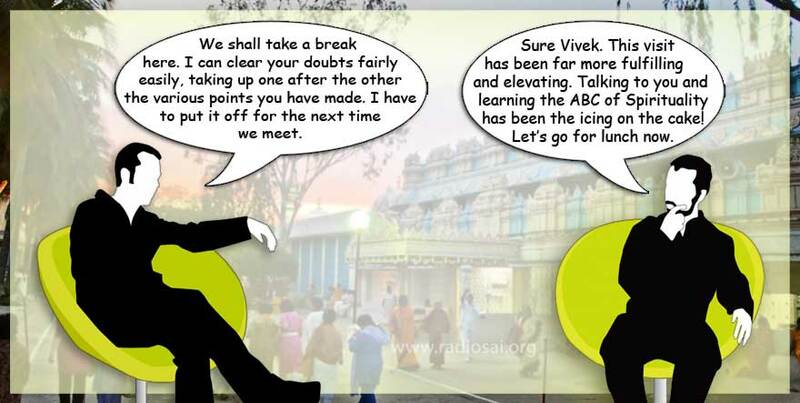 VIVEK: Thanks for the compliment dear friend, but don’t you think you should reserve them until our dialogue is over? Come on, let’s rush to the canteen before it becomes too crowded. Thus ends Varun’s first ever visit to Prasanthi, to learn more about Spirituality and its relationship to the daily world. Varun would be back again next week. We will update you with what they discuss shortly.